The Virginia House of Delegates is one of two parts in the Virginia General Assembly the other being the Senate of Virginia. It has 100 members elected for terms of two years; unlike most states, these elections take place during odd-numbered years. The House is presided over by the Speaker of the House, who is elected from among the House membership by the Delegates. The Speaker is almost always a member of the majority party and, as Speaker, becomes the most powerful member of the House. The House shares legislative power with the Senate of Virginia, the upper house of the Virginia General Assembly. The House of Delegates is the modern-day successor to the Virginia House of Burgesses, which first met at Jamestown in 1619. The House is divided into Democratic and Republican caucuses. In addition to the Speaker, there is a majority leader, majority caucus chair, minority leader, minority caucus chair, and the chairs of the several committees of the House. Through the House of Burgesses, the Virginia House of Delegates is considered the oldest continuous legislative body in the New World. Originally having 22 members, the House of Burgesses met from 1619 through 1632 in the choir of the church at Jamestown. From 1632 to 1699 the legislative body met at four different state houses in Jamestown. The first state house convened at the home of Colonial Governor Sir John Harvey from 1632 to 1656. The burgesses convened at the second state house from 1656 until it was destroyed in 1660. Historians have yet to precisely identify its location. The House has met in Virginia's Capitol Building, designed by Thomas Jefferson, since 1788. The legislative body met from 1788 to 1904 in what is known as today the Old Hall of the House of Delegates or commonly referred to as the Old House Chamber. The Old House Chamber is part of the original Capitol building structure. It measures 76 feet in width and is filled today with furnishings that resemble what the room would have looked like during its time of use. There are many bronze and marble busts of historic Virginians on display in the Old House Chamber, including: George Mason, George Wythe, Patrick Henry, Richard Henry Lee, and Meriwether Lewis. From 1904 to 1906, University of Virginia graduate and architect John K. Peeples designed and built compatible classical wings to the west and east side of the Capitol building. The new wings added to provide more space and serve as the legislative chambers in the Virginia General Assembly, the Senate of Virginia resides in the west chamber and the House of Delegates resides in the east chamber. The General Assembly members and staff operate from offices in the General Assembly Building, located in Capitol Square. Prior to 1788 the House of Delegates met in the Colonial Capital of Williamsburg. In 1999, Republicans took control of the long-time Democratic House of Delegates for the first time since Reconstruction (with the exception of a brief 2-year period in which the Readjuster Party was in the majority in the 1880s). The annual salary for delegates is $17,640 per year. Each delegate represents roughly 83,000 people. Candidates for office must be at least 21 years of age at the time of the election, residents of the districts they seek to represent, and qualified to vote for General Assembly legislators. The regular session of the General Assembly is 60 days long during even numbered years and 30 days long during odd numbered years, unless extended by a two-thirds vote of both houses. ↑ Democrat Lynwood Lewis (District 100) resigned to take his seat in the Virginia Senate after winning the January 7 special election to replace Ralph Northam. ↑ Republican Robert Bloxom, Jr. replaced Lewis after winning February 24 special election. ↑ Democrat Bob Brink (District 48) resigned to serve as deputy commissioner for aging services at the Department of Aging and Rehabilitation Services and Democrat Algie Howell resigned to take a seat on the Virginia Parole Board. ↑ Democrat Rip Sullivan (District 48) replaced Brink and Democrat Joe Lindsey replaced Howell after winning August 19 special elections. ↑ Republican Ben Chafin (District 4) takes seat in Virginia Senate after winning special election. ↑ Democrat Rosalyn Dance (District 63) takes seat in Virginia Senate after winning special election. ↑ Republican Barbara Comstock (District 34) resigns after being elected to the U.S. Congress. ↑ Republican Todd Pillion (District 4) takes Chafin's old seat after winning special election. ↑ Democrat Joe Morrissey (District 74) resigns his seat. ↑ Democrats Kathleen Murphy (District 34) and Joseph E. Preston (District 63) take Comstock's and Dance's old seats after winning special elections. ↑ Joe Morrissey reelected to his old seat as an Independent. ↑ Joe Morrissey moved to a residence outside his district, in violation of Article IV Section 4 of the Virginia Constitution. The House has 14 standing committees. The Virginia House of Delegates is reelected every two years, with intervening vacancies filled by special election. The next general election of the House is in November 2017. ↑ "This Day in History". Retrieved 23 March 2016. ↑ Commonwealth of Virginia. "Capitol Square Timeline". Retrieved 26 April 2011. ↑ Commonwealth of Virginia. "Timeline". 1 2 "Virginia House of Delegates". DailyPress.com. Retrieved 2008-09-11. 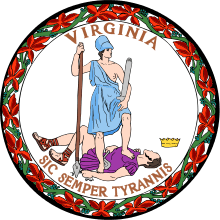 1 2 "Virginia State Legislature" (PDF). VAKids.org. Archived from the original (PDF) on May 17, 2008. Retrieved 2008-09-11. ↑ "Constitution of Virginia, Article IV, Section 4. Qualifications of senators and delegates.". Virginia General Assembly. Retrieved 2008-10-22. ↑ "Constitution of Virginia, Article IV, Section 6. Legislative sessions.". Virginia General Assembly. Retrieved 2008-10-22. ↑ The 1997 general election yielded a 51-48-1 Democrat majority. David Brickley resigned his seat right afterward, however, and a special election for District 51 was called. His seat flipped to the Republicans, and with Independent Lacey Putney siding with the Republicans, the chamber was tied. Democrats retained the Speakership through a power-sharing agreement. ↑ Kumar, Anita (2011-11-19). "Toscano, Sickles to lead House Democratic caucus". Washington Post. Retrieved 21 November 2011. ↑ "Legislative Committees". Legislative Information System. Virginia General Assembly. Retrieved 2016-01-14.